Home > National Drugs Strategy 2009-2016: progress report to end 2013. Ireland. Department of Health. 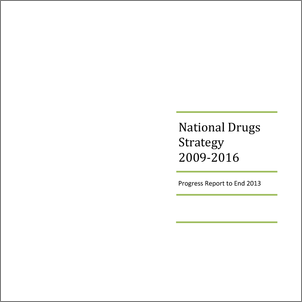 (2014) National Drugs Strategy 2009-2016: progress report to end 2013. Dublin: Department of Health. The National Drugs Strategy 2009-16 is based upon a co-ordinated approach across the full range of Government Departments and Agencies involved in delivering drugs policy. The overall objective of the Strategy is to tackle the harm caused to individuals, families and communities as a result of problem drug and alcohol use through the five pillars of supply reduction, prevention, treatment, rehabilitation and research. The progress achieved across the 63 Actions of the National Drugs Strategy by Government Departments and Agencies is reported here.